I am interested for four years by the emergence of some Flemish chefs. Initially I saw it as some “Électrons libres” in the Kingdom of Belgium, but after my first (2-3) interviews with Filip Claeys, Kobe Desramaults, Gert De Mangeleer, I understood that it was much more … Beyond the media trend to always seek “the Next Big Thing”, there are actually in Flanders a lot of creativity, an uniqueness and a willingness by the chefs to highlight an often overlooked “terroir”. Many of these chefs have done an internship at Oud Sluis restaurant (chef Sergio Herman) but the chef Michael Vrijmoed comes rather from the other school, that of great chef Peter Goossens (Hof Van Cleve). It is after eight years as Sous chef at Hof Van Cleve that this young chef (33 years old) decided to open his own restaurant, Vrijmoed in Ghent. Besides his talent and his creativity, it is this longevity that struck me, it is rare to see in 2013 a young chef stay as long in a restaurant! Vrijmoed loves its “terroir” and it is perceived in its plates. The dishes are originals, technical, complex and simple in same time. This simplicity in appearance rather reflects a harmonic complexity that finds its influences everywhere. There are a few things of Pascal Barbot in his “cuisine”, just a feeling! There is another school in Flanders equally talented and dedicated to the unique “terroir”! Try Vrijmoed and Ghent before this city became a must in June 2013! 1-(Scoffier) How do you explain the philosophy behind your cuisine and what is it main characteristics? MVrijmoed– A pure “cuisine” where we follow the seasons. We start with the search of a good (honest) product and we create a dish without overloading it with to many ingredients. 2-(Scoffier) You worked almost 8 years as sous chef for one of the most important restaurants in Belgium, Hof van Cleve. What have you learned with the chef Peter Goossens? 3-(Scoffier) Why did you decide to open your own restaurant now (2013)? MVrijmoed– It was a dream for a long time to open one day my own restaurant and to do “my things” but I waited for the good moment, when I would be ready in all aspects. 4-(Scoffier) Do you have a flavour or taste from your childhood that is again memorable? MVrijmoed– The smell or taste of a fresh baked bread is something that I adore, we make our own bread in the restaurant and will keep doing that for the future for that reason. 5-(Scoffier) Do you have a particular foods (or products) that you often use in your recipes? MVrijmoed– I like acidity or the use of citrus in my dishes. 6-(Scoffier) Do you have a mentor (chefs or anybody else) that inspires in your career? MVrijmoed– For sure Peter Goossens was one of these persons. But also Guy Van Cauteren who closed his restaurant this year (after almost 40 years) where I really learned “what’s cooking”. There are other chefs that touched me with their “cuisine” including Michel Bras, Pascal Barbot and of course many others! 7-(Scoffier) How do you develop (process) your recipes? What are your source(s) of inspiration? MVrijmoed– I start with the “main ingredient” of a dish and I think to how I would love to eat it. Next step is thinking what are the seasonal products who would improve the dish. 8-(Scoffier) I had the chance to interview some talented young Flemish chefs, the restaurant scene looks very original and singular in Flanders (I think at Bruges, Ghent…). How do you explain that? MVrijmoed– I think it’s true that we have some really talented young chefs in Belgium, who (may be the most important) do their own “cuisine” and give a 100% in their work all the time. 9-(Scoffier) Can you give us a detailed recipe (Signature dish or one that you like now) that is characterized the cuisine of Michaël Vrijmoed? MVrijmoed– Recipe: Confits of pork cheeks, goose liver, roasted spring onions and “saltcrustbaked” cevenne onions. 10-(Scoffier) What are your goals (ambitions) as chef and for Restaurant Vrijmoed? MVrijmoed– Keep on going as we do now, two (2) months after the opening: make the people happy with “la cuisine” we do! 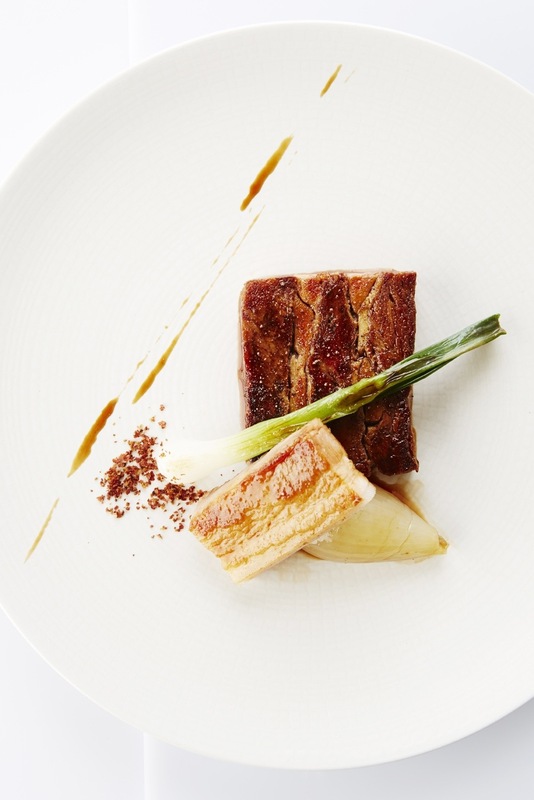 RECIPE: Confits of Pork Cheeks, Goose Liver, Roasted Spring Onions & “Saltcrustbaked” Cevenne Onions. –No Instruction. A little secret even as the restaurant has just opened! © Credits for photos at Restaurant Vrijmoed.